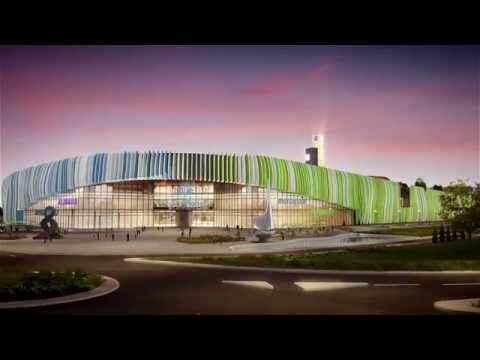 Delta Real Estate (a member of Delta Holding) will start the construction of the largest and most exclusive shopping mall so far in Serbia under the name “Delta Planet”. The shopping mall of around 200.000 sq m in total area will be located at Autokomanda, Belgrade, by highway E-75, in the direction of Niš. The project is worth 200 million EUR, which will be the largest investment by Delta Real Estate Group in the coming period, but also the second largest real estate investment in Serbia in the period from 2000 to date. According to the plan, Delta Planet will offer 250 shops with various contents to visitors. At least 50 brands are expected to offer their goods for the first time in the Serbian market and at least four most attractive brands will appear in shops with over 3.000 m2 in area. Shops, service shops, restaurants and cafes will occupy two levels of the shopping mall, with easy communication through the facility. Below these two levels there will be a hypermarket and above them an entertainment level: cinema, spa and wellness centre, sports amenities and similar offer intended for fans of healthy lifestyle. The roof of the facility will be a green oasis with 6.500 m² in area. Delta Planet will be the first in Serbia to offer a cinema with the state-of-the-art IMAX technology, with picture and sound quality never seen before in this market. An underground garage and outdoor parking lots will provide 2,300 parking spaces. Facing the highway, there will be a LED façade of around 5,000 m² in area, which will provide a special experience with its dynamic structure and light effects. A vertically landscaped façade made of natural materials facing Tabanovačka Street, with paths and landscaped areas, will provide a special effect to this access to the shopping mall. The main entrance for visitors is envisaged from the direction of the Autokomanda roundabout, with a large square and outdoor cafés envisaged at the entrance, which will provide both a new offer and a new look to this part of the city.